One of the four main holy days in the Tibetan calendar, Lhabab Duchen celebrates the Buddha’s return to earth after teaching the Dharma to his mother in the God Realm of the Thirty-Three. All merit created on this day is multiplied 100 million times. ♥ Watch Ven. Chodron’s short 2014 talk on Lhabab Duchen and repaying the kindness of our parents. ♥ Read or watch Ven. Chodron’s teaching on taking refuge in the Three Jewels. 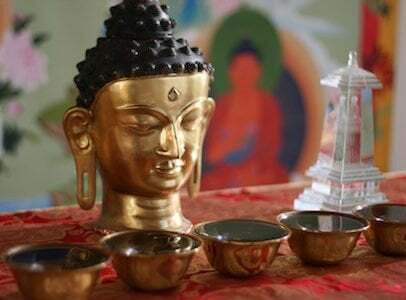 ♥ Make special offerings to your teachers, Dharma center, or monasteries. Click here to include the Abbey in your offerings.